How many types of neutrinos are there? That was Day 3+4’s Big Question. Your Day 3+4 breakdown is finally here. A lack of internet access is always an issue. At any rate, things were a very great mix of experimental results and theoretical discussions that all pointed to one question: How many types of neutrinos are there in the Universe? According to the Standard Model, which itself is founded on very rich experimental results, there are 3 flavors: electron-neutrino, muon-neutrino, and tau-neutrino. 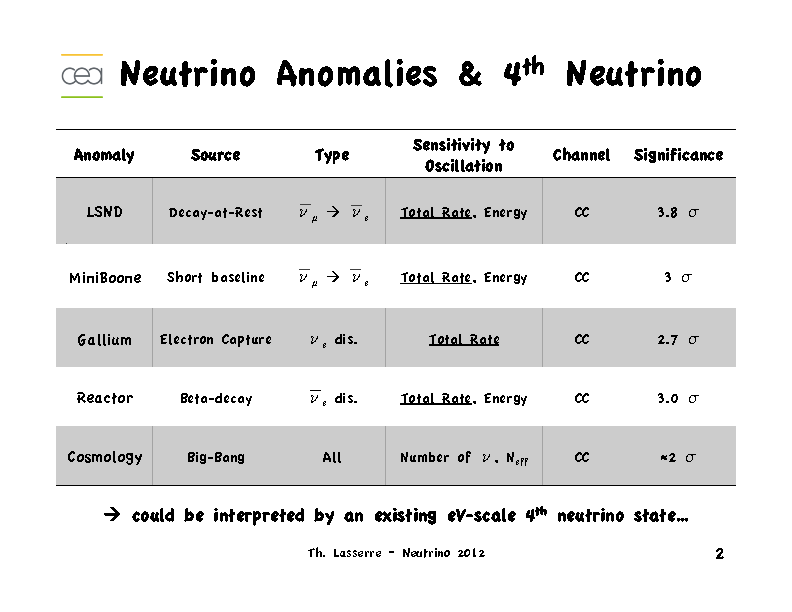 However, it is very possible there are more neutrinos that do not have any charges under the Standard Model. Such neutrinos are called sterile neutrino or singlet neutrinos. 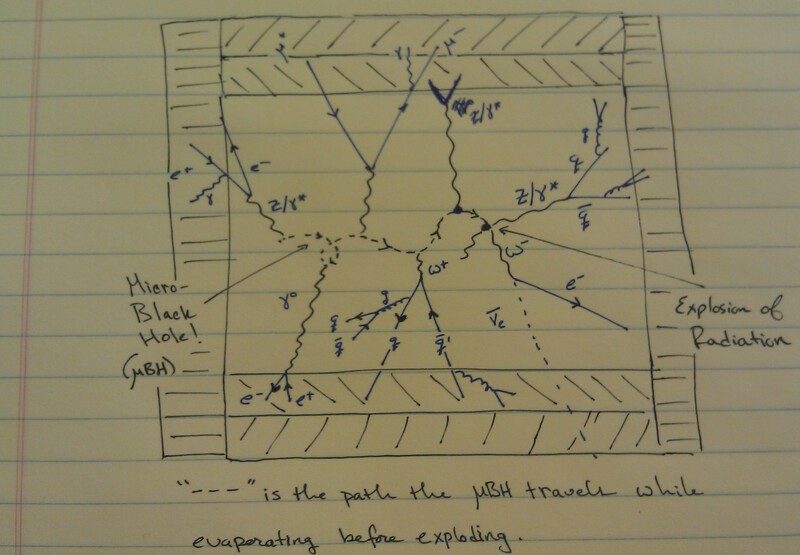 Without further ado: MiniBooNE, Neutrino Anomalies, KamLAND-Zen, EXO-200, and Day 4. 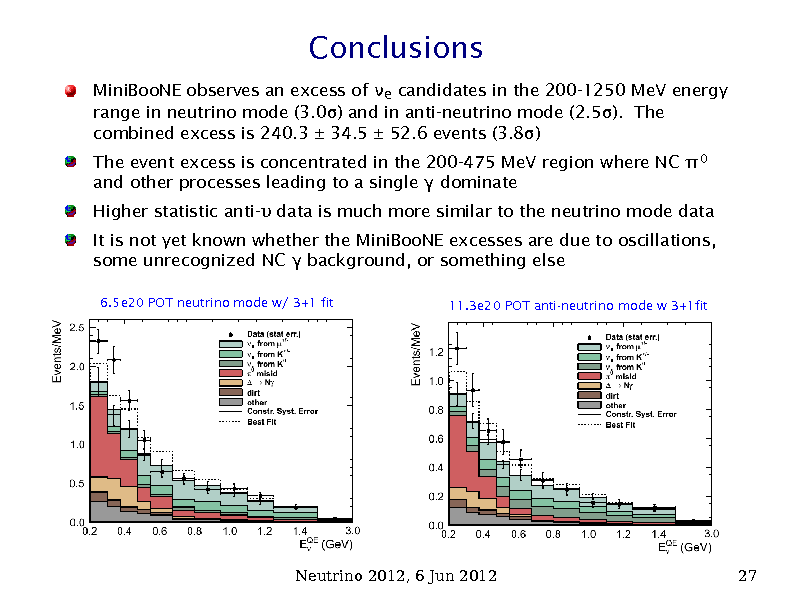 A quick breakdown of what the Miniature Booster Neutrino Experiment, or MiniBooNE for short, is all about can be given in the following two slides. Fermilab accelerates protons into a fixed target to produce pions and kaons. The pions and kaons are then directed toward the ground and squeezed together by a system of magnetic fields called “the horn.” The pions then fly for a period of time, decaying into muons, electrons, and neutrinos. The muons further decay into more neutrinos and electrons. When the electron and neutrino beam hits the ground, the electrons are absorbed and the neutrinos pass through the planet. Finally, after popping out in a deep underground Minnesota mine, the neutrino beam flies through the MiniBooNE detector and physics is born. 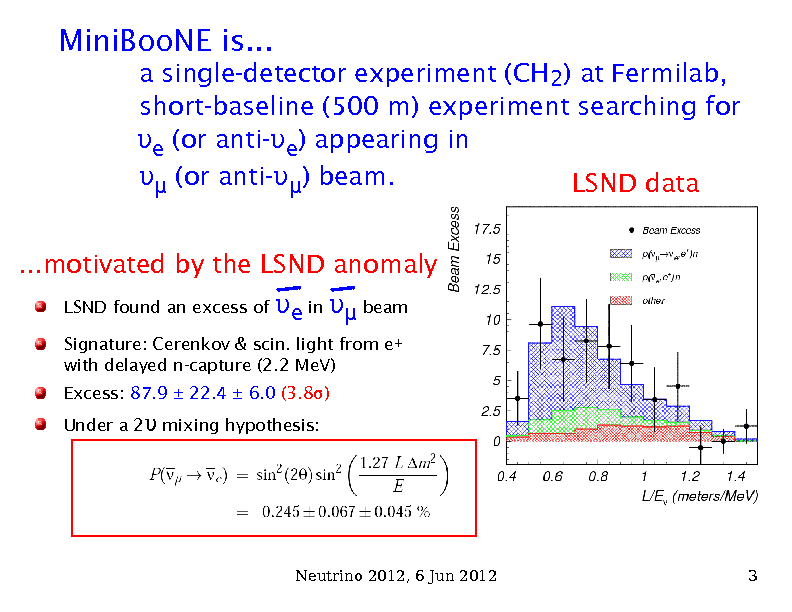 One of MiniBooNE’s chief scientific goals is to confirm or refute the result of a previous experiment, LSND, which observed an excess of neutrinos. 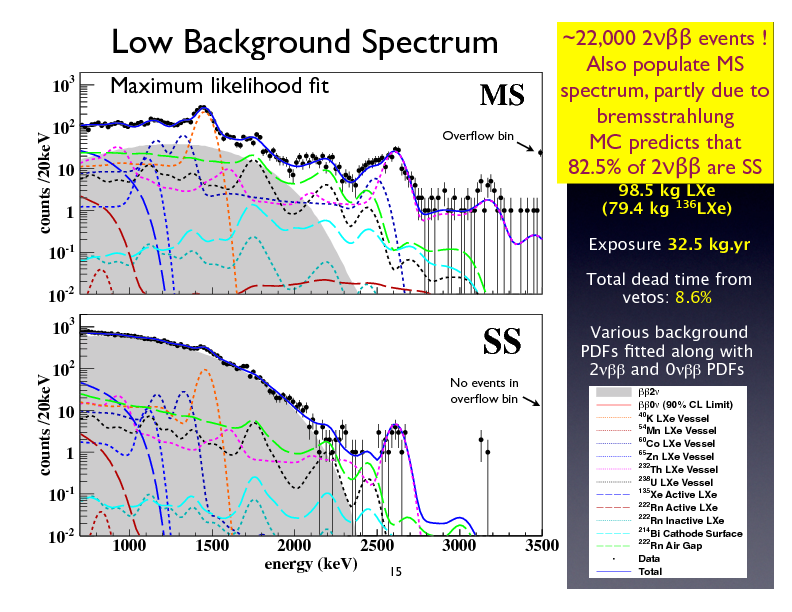 The excess was best described by introducing a single sterile neutrino and we still do not know if the result was a statistical fluke or something more serious. The experiment has announced for the first time with its full dataset, that it has observed an excess number of anti-muon-neutrinos converting to anti-electron-neutrinos. This excess is almost entirely in the lower energy range, i.e., smaller energy transfer between neutrinos and detector, and the experiment is trying vigorously to determine if this has been caused by a previously unknown background. The prospect of adding a new neutrino to the Standard Model is a tricky issue, let alone adding two. Theoretically it is not terribly difficult but such a step would have very obvious and quickly testable predictions. The first of several theory talks (I am skipping my synopsis of all other theory talks) had a summary of known anomalies from neutrino experiments. LSND and MiniBooNE has already been discussed and the largest. A rather recently discovered discrepancy is the number of neutrinos predicted to be produced by nuclear reactors. The calculation is very well known but had not been updated in years. After recalculating the expected neutrino production rate, the predicted rate was found to be larger than the observed rate. Strictly speaking, all results ARE consistent with the Standard Model and we cannot make any definitive statements based solely on what is listed here. 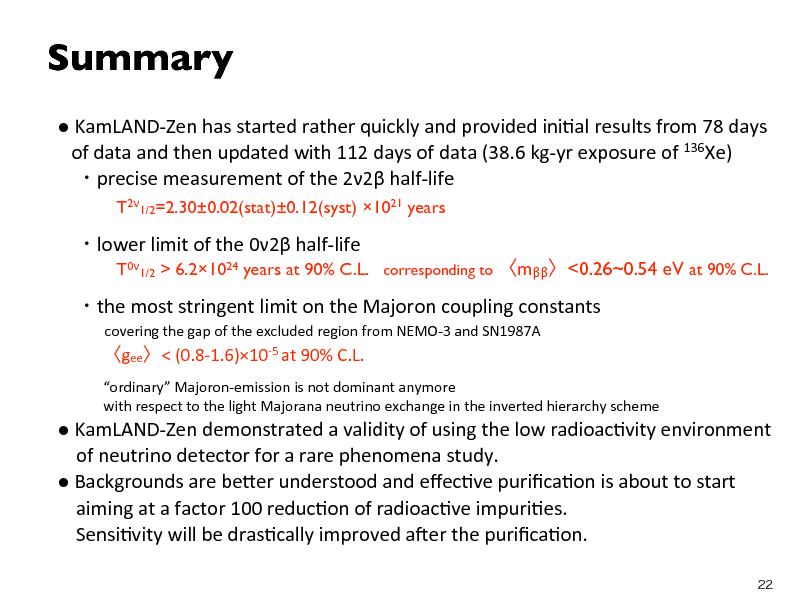 On to KamLAND-Zen, which stands for Kamioka Liquid Scintillator Anti-neutrino Detector – Zero Neutrino Double β-Decay (pronounced: beta-decay). This experiment has got to be the best example of when an experiment collaboration just stops trying to write its experiment name as a logical acronym. It is still a wicked-cool name. Nuclear β-decay is one of the most well-studied examples of radioactivity where a nucleus in an atom will disintegrate into a lighter nucleus, plus an electron (or a positron), and an anti-electron-neutrino (or a regular electron-neutrino). Some radioactive elements can also undergo the super rare double β-decay where two β-decays occur simultaneously. In the case that a sterile neutrino does indeed exist, then the even more rare neutrino-less double β-decay should be possible. In this situation, two nuclei in an element will disintegrate into two lighter nuclei and only two electrons (or positrons!). 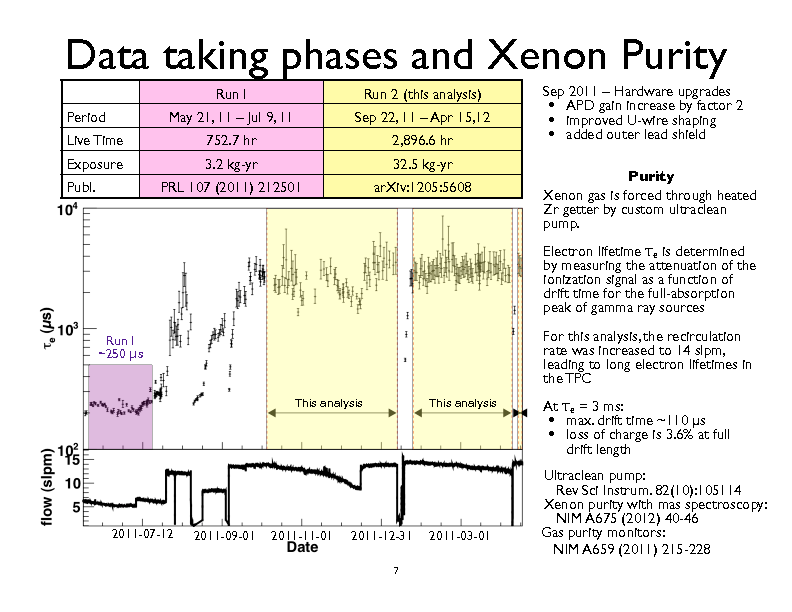 KamLAND-Zen is looking for such a decay in the gas xenon but has had no such luck. 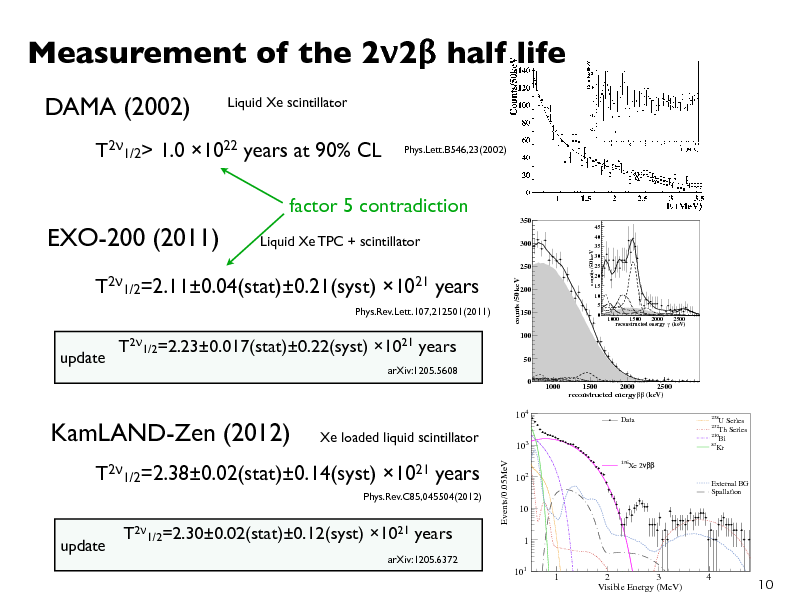 It has, however, been able to measure the rate of the still-very-rare 2-neutrino-double β-decay in xenon, an impressive feat in and of itself. The experiment was also able to disprove a previous measurement of this rate from a different experiment called DAMA. Here are the results. The Enriched Xenon Observatory Experiment, or EXO-200 for short (the 200 is explained on wiki), is KamLAND-Zen’s biggest competitor in the race for finding neutrino-less double-β-decay. 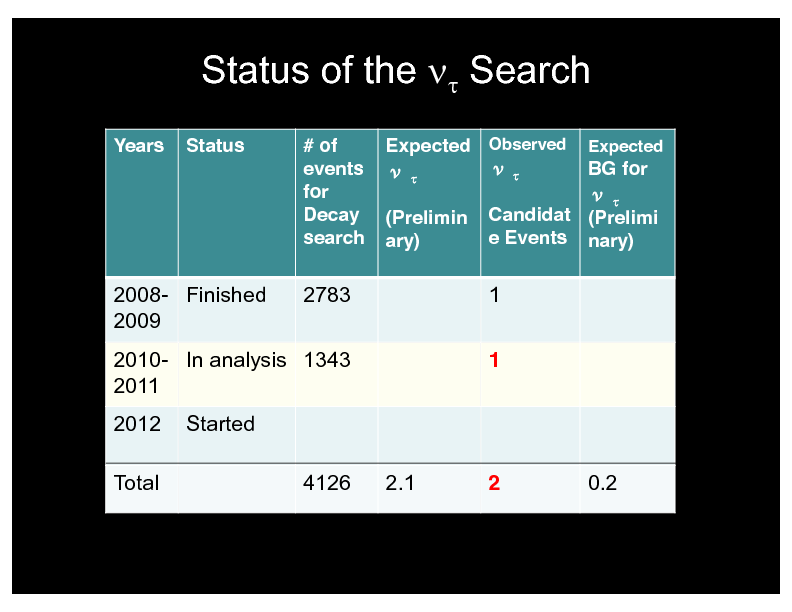 The first slide shows how much more data they have since the last time their results were announced. 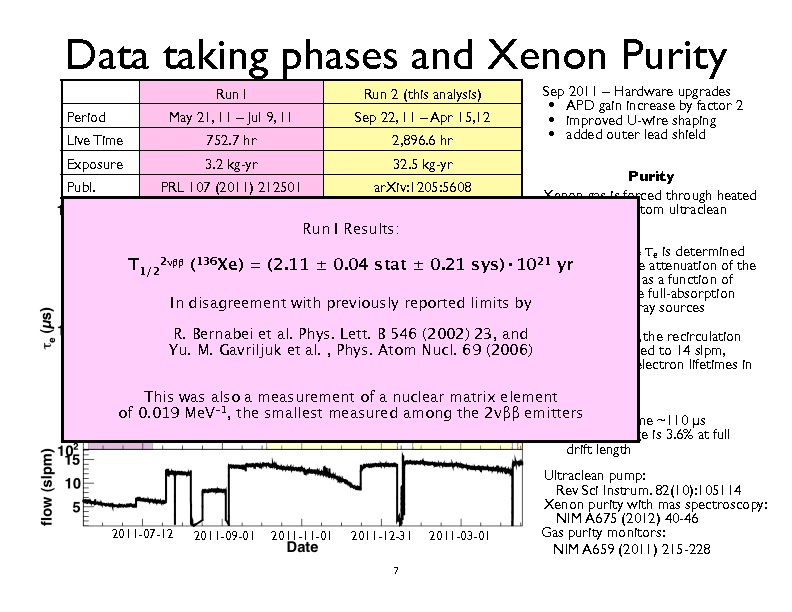 The second slide shows their background and the fact that they have observed almost 22,000 2-neutrino double β-decay events! I cannot describe how cool that is other than say just that: it is really cool that they have so many events. Consequentially, their results are in good agreement with KamLAND-Zen’s results. 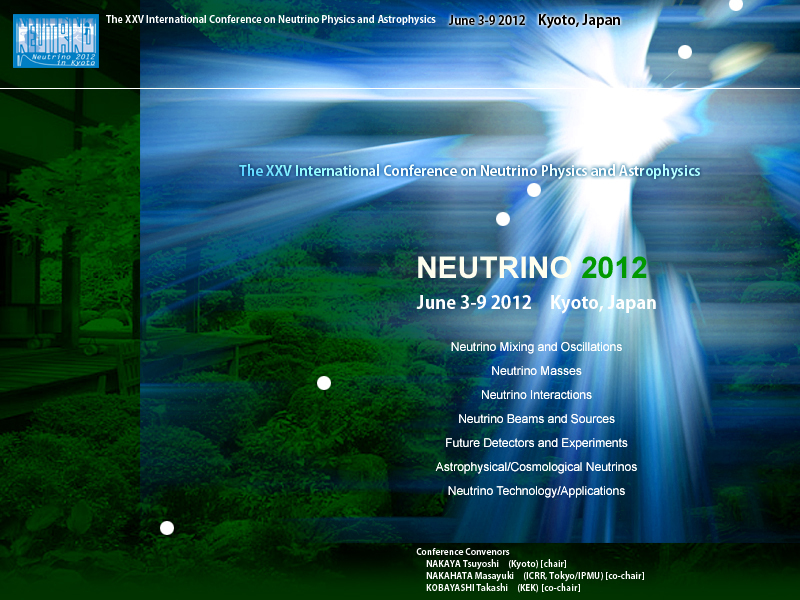 So sadly, no neutrino-less events. Day 4 was a much needed rest for conference goers. Like most other attendees, I spent the day exploring Kyoto and then working with my adviser on a paper we are hoping to finish soon. In the evening, however, we were treated to a dance performance by real-life geisha dancers. I was unable to get too many photos but below is a good one. The two dancers are both geiko-sans (fully-fledged geisha dancers) but there were also three maikos (apprentice geisha dancers). After the short entertainment, the main event began: a public lecture on the importance of neutrinos and their influence on how the Universe evolved, given by Prof. Hitoshi Murayama, Director of the University of Tokyo’s Institute for Physics and Mathematics of the Universe. Sadly, I was unable to find his slides online, which is especially unfortunate considering his talk was entitled, “Neutrinos May Be Our Mother.” I was able to snap this photo of Prof. Murayama discussing his recent meeting with the Prime Minister of Japan and philanthropist Fred Kavli, of the famed Kavli Foundation. Mr. Kavli’s generous contributions to physics and astronomy have led to the construction of dozens of institutes around the world to focus and have allowed us to concentrate on the most important mysteries of this universe we call home. 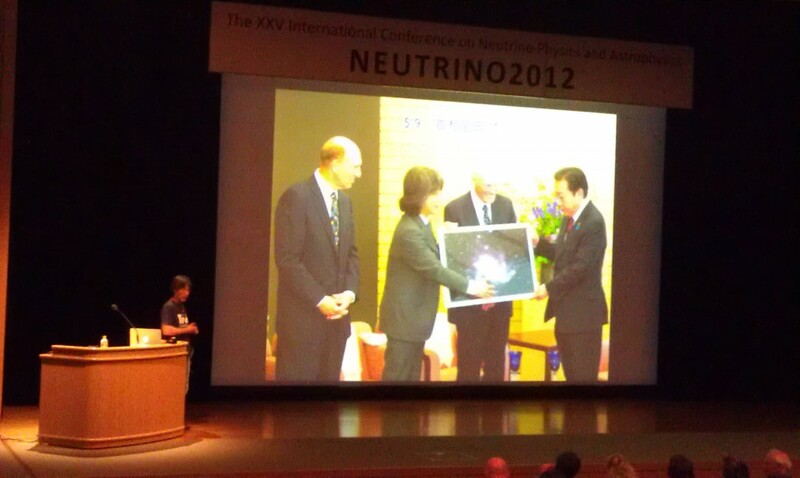 Figure 12: Prof. Hitoshi Murayama (Far Left), sharing a picture of his meeting with Mr. Fred Kavli (Second from Right), and Prime Minister Yoshihiko Noda (Far Right). Credit: Mine. 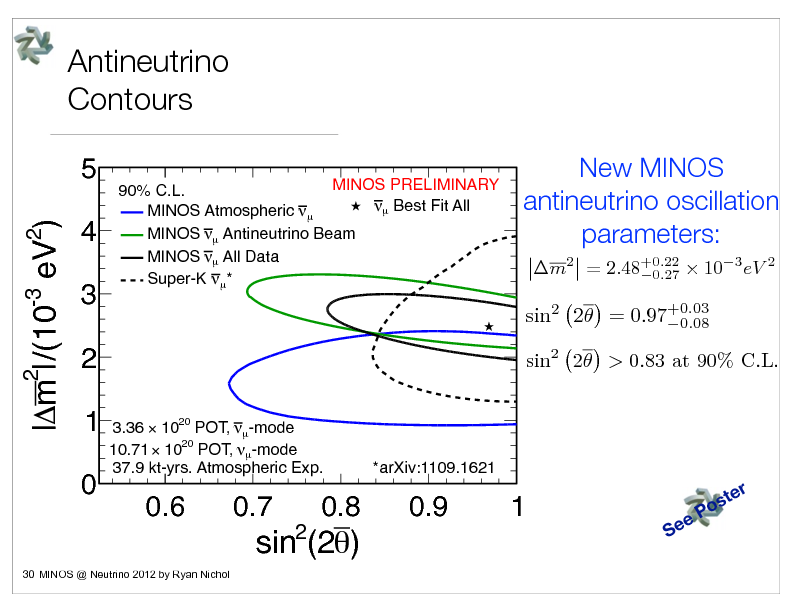 When it comes to neutrino experiments, they were all there Day 2: T2K, MINOS, OPERA, ICARUS, and NOνA, and LBNE! Here is a run down of what happened Tuesday. I will try to post Day 3 things this afternoon, which should be Wednesday morning for the US. An update on the LBNE is at the bottom of the post. 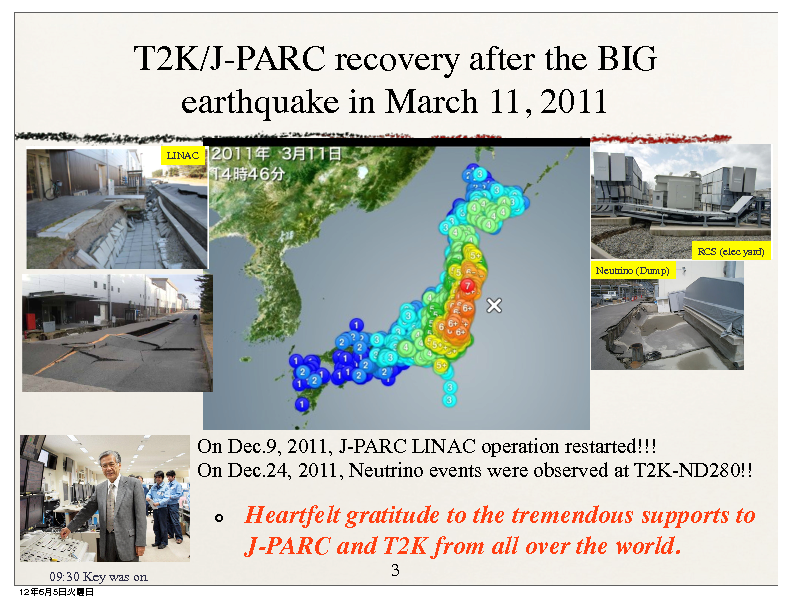 Figure 1: Update of T2K experiment after March 11, 2011 earthquake that struct Japan. Credit: NAKAYA, Tsuyoshi. The Tokai to Kamoika Experiment, or T2K for short, is a one impressive behemoth of an experiment. Much like MINOS Experiment at Fermilab, you shoot protons into a target to make pions. 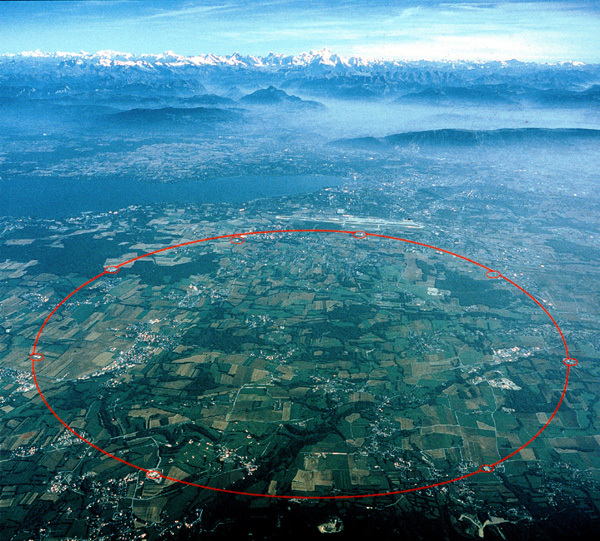 The pions then decay into neutrinos, and the neutrinos travel 183 mi (295 km) through the Earth to the (Super-, Hyper-) Kamiokande detector in Kamioka, Japan. The MINOS Experiment at Fermilab is most simply described at the US version of T2K. It is unfair and a disservice to both MINOS and T2K to make that comparison because of the unique features of the experiments, but I have a lot to write. 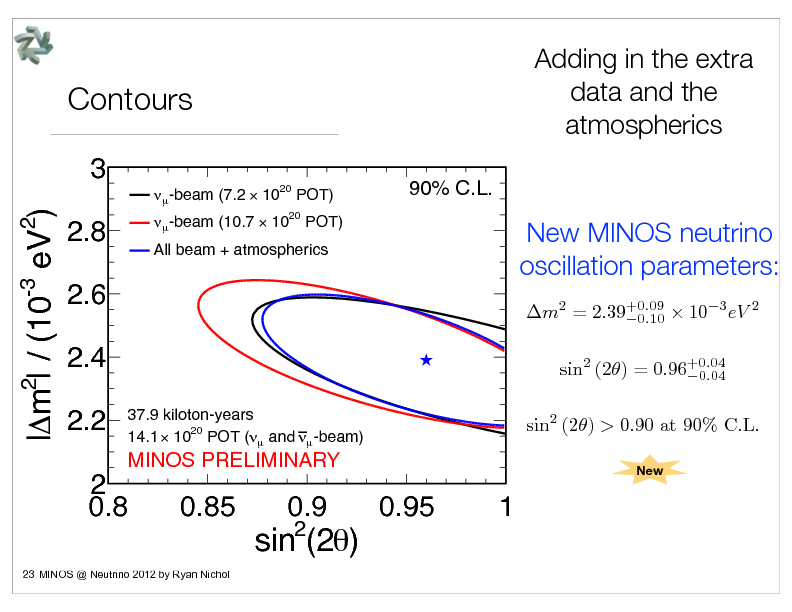 In 2010, MINOS caused a bit of a stir when it measured the mass difference between two of the three anti-neutrinos. The measurement itself was not at all controversial. The issue was that this result differed from the well measured mass difference for regular neutrinos. Here the Fermilab presser that can tell you all about it. 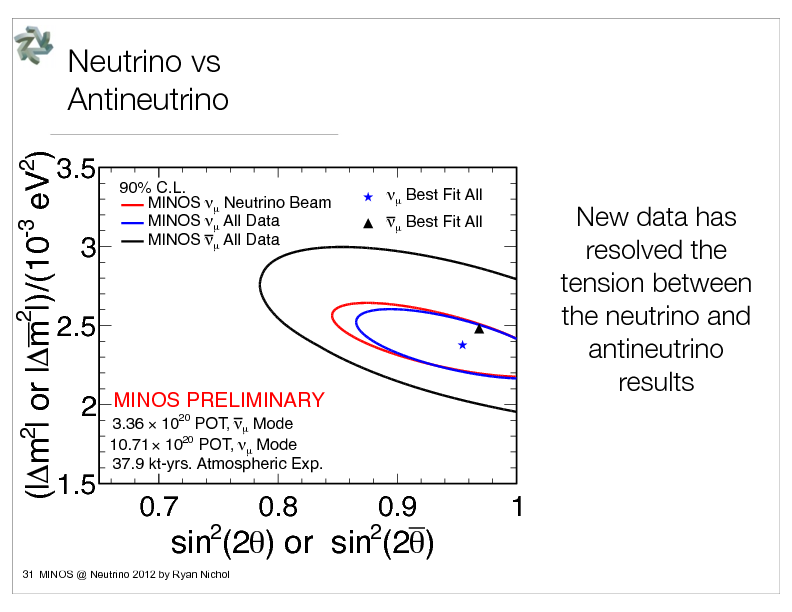 On Day 2, MINOS announced that the discrepancy between neutrinos and anti-neutrinos has completely disappeared and that the previous disagreement is believed to have been a statistical fluctuation. It appears that Fermilab has released a new press release this morning explaining things in more detail. Below are the main plots. Oh, and MINOS data also slightly favors inverted hierarchy for anyone interested in that. 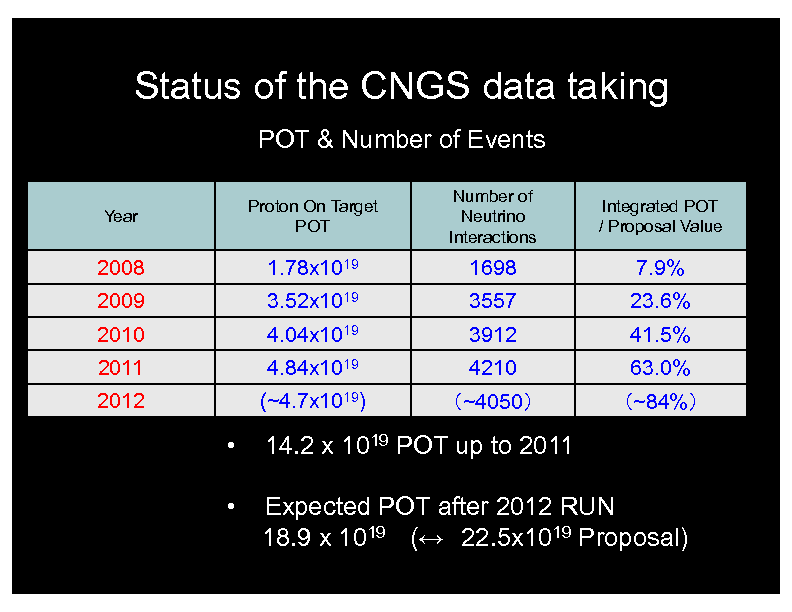 Fun fact: In its seven years of running, MINOS has used over 1.5 sextillion protons to produce all of its neutrinos. The OPERA Experiment, or Oscillation Project with Emulsion-tRacking Apparatus, is a fine and mighty experiment capable of one of the most time-consuming tasks in neutrino physics that even tests the patience of sleeping mountains: observing the conversion of tau-neutrinos into muon-neutrinos. 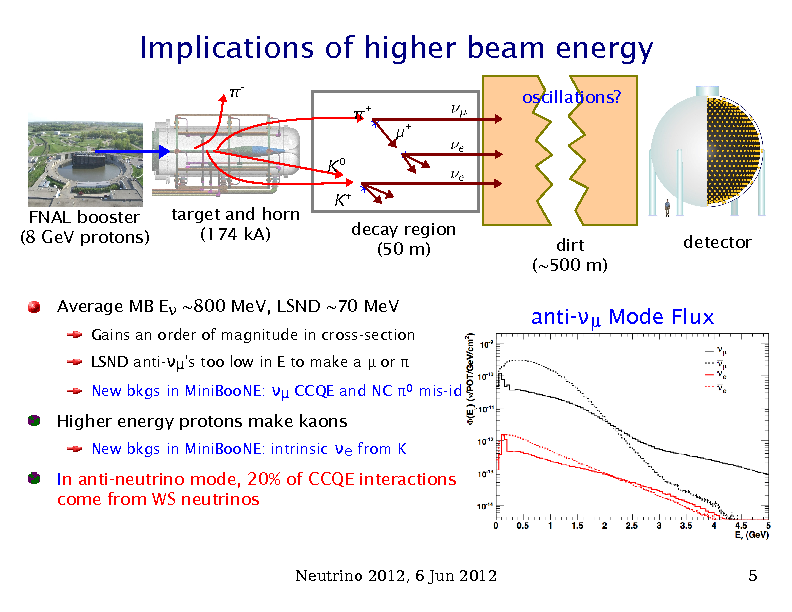 Like T2K and MINOS, OPERA gets its neutrinos from pions, which are produced when protons strike a fixed target. Specifically, the experiment uses CERN protons in its first four years of running has used about 14.2 x 1019 protons! OPERA’s defining characteristic is how well it is able to extract out a signal from everything else. Below is an example of a real event in which a neutrino has collided with a nucleus, producing a charge lepton and nucleus somewhat fragments. 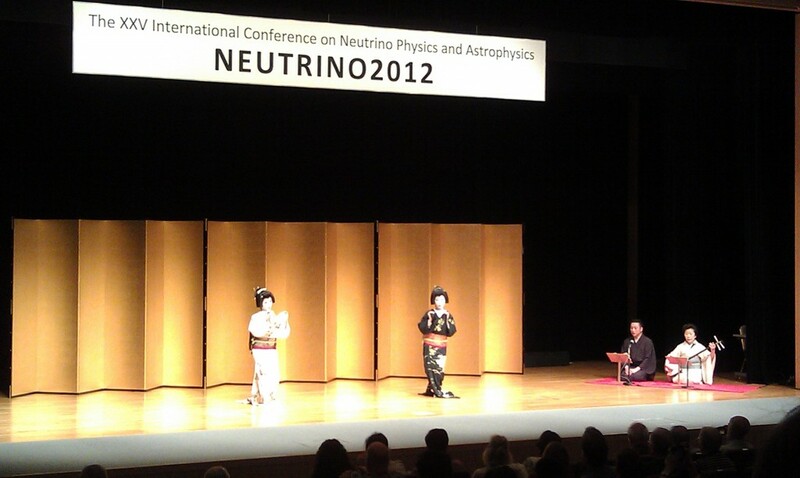 The big news from OPERA on Day 2 was the second observation of a muon-neutrino converting into a tau-neutrino! 2 events in over four years; I told you this thing required patience. Here is how the event works. Here is an explanation of the event. 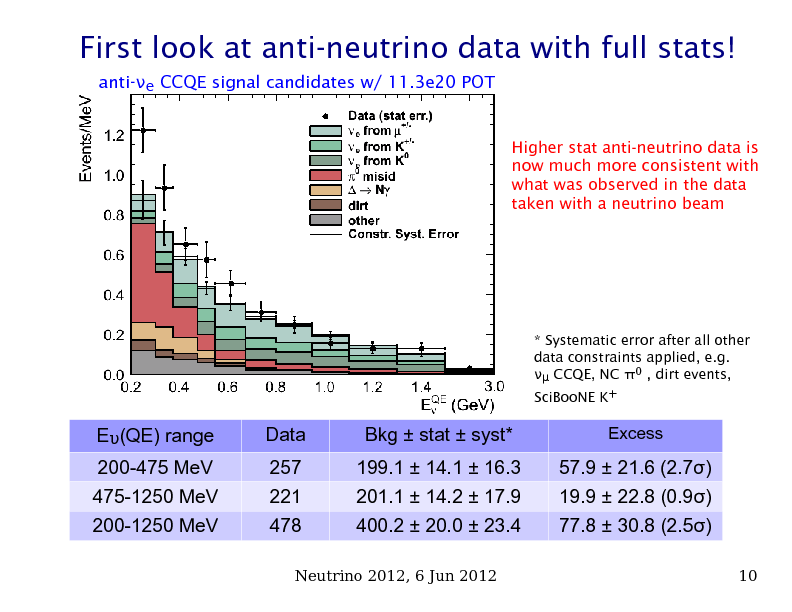 Finally, here is a summary of the status of OPERA’s search tau-neutrinos. It is worth mentioning that the experiment also announced it has observed 19 instances where a muon-neutrino has converted into an electron-neutrino! Due to the lack of time, I will simply say that one can expect big things from ICARUS and NOνA when they both have results. ICARUS has already started running and the gigantic, LHC-Detector-sized NOνA will start running next year when Fermilab flips on its proton beam again. NOνA will be capable of determining whether neutrinos have normal mass hierarchy or inverted mass hierarchy. Interesting things happen at conferences, like an impromptu talk added the morning of the second day of events. 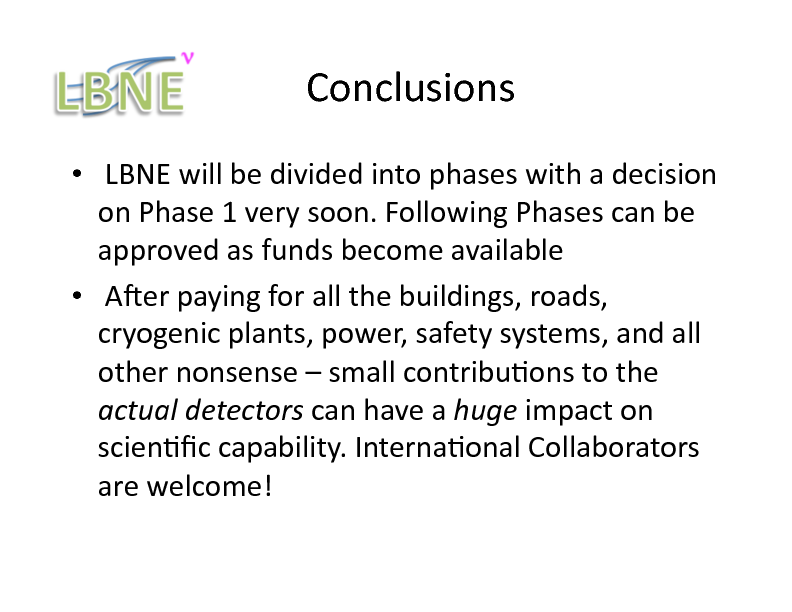 Long Baseline Neutrino Experiment co-spokesperson Robert Svoboda surprisingly gave an update of the LBNE, the first since its budget was gravely slashed. Much is still being kept internally for another few weeks when the final proposal will be submitted, so I will limit what I say. 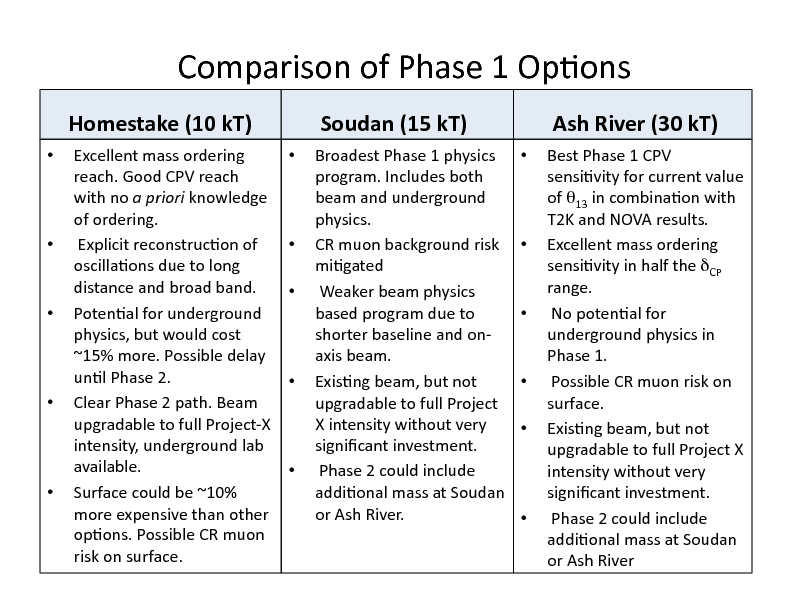 In summary, there are three options being considered for the experiment for phase 1 construction. Beyond that, it is up to the Funding Lords. Updated: Tuesday June 5, 2012 13:23 local (Kyoto) time. Sorry for the delay. The conference’s schedule is jammed packed, and not basking in a wireless cloud limits my access to the site. At any rate, Monday was a very productive day. For the first time under a single roof, all the nuclear reactor-based experiments showed their measurement of θ13, the physical quantity that stipulates the probability of two specific neutrinos turning into each other. θ13 (pronounced: theta-one-three) has been extensively covered here if you are interested in reading more about it. Herein lies the purpose of conferences: to allow experimentalists and theorists the opportunity to compare and contrast highly important results from similar experiments. Checking that everyone’s results agree also shows the importance of redundant experiments. Fig. 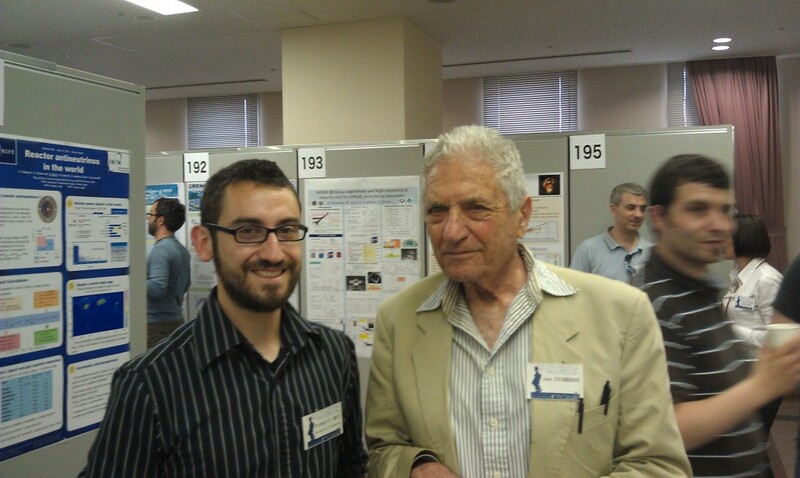 1: Me with Nobel Laurate Jack Steinberger at the first poster session of the Neutrino 2012 Confereince in Kyoto, Japan. A rather interesting talk was a talk entitled “Application of Reactor Anti-Neutrinos.” Nuclear reactors are incredibly useful for physics because they are a controlled source of neutrinos. Unfortunately, plutonium is an inherent byproduct of nuclear reactors. However, we can look at this another way: plutonium-producing reactor is a generous producer of neutrinos. This clever rearrangement of words is the premise of one potential breakthrough in nuclear non-proliferation: uncovering the mass production of Pu via neutrinos. I have to run, but in short “the anti-nutrino has a possibility to monitor reactor operation and Pu contents in operation core.” It reminds me a bit of Laureate Luis Alvarez’s clever use of cosmic rays to image the internal structure of Egyptian pyramids. Greetings from Kyoto! The sun is high and the solar neutrino rate is brimming. It is Day 1 of Neutrino 2012, an annual conference dedicated to all things neutrino, and today’s talks about about to begin shortly with a welcome from, count them: two Nobel laureates. The first is by Jack Steinberger, co-discoverer of the muon neutrino along with science education advocate Leon Lederman, on the present state of neutrinos, what we know about them, and what we definitely do not know. It is a highly appropriate talk to kick off such an important conference. The second talk is by Makoto Kobayashi, “K” of the famed CKM matrix, and is on the existence of neutrino masses and how that discovery has defined a generation of on-going research. Okay, time for the bad news. There is no internet in the main lecture hall and, as a consequence, I cannot physically live-blog this week. This is a bit of a disappointment but check back here often for regular updates through the week. After an interesting conversation on the flight over here, I am expecting to hear some very interesting and very new results. Hi All! Today marks the beginning of the Phenomenology 2012 Symposium, Pheno for short, or #Pheno2012 if you are into hashtags, here at the University of Pittsburgh. It will definitely be an exciting three days because this conference is dedicated solely to promoting the partnership and collaboration between experimentalists and theorists. For experimentalists, this is a grand opportunity to learn about new theories that may actually be testable at the Large Hadron Collider; it is also a chance to learn about new ways to test well-known ideas. Similarly, for theorists, this is an opportunity to learn about the fine details of a particular study for new physics. It is one thing to rule out the existence of certain particles (like squarks! ); it is an entirely separate situation if there were special caveats were assumed (like most every search for squarks!). 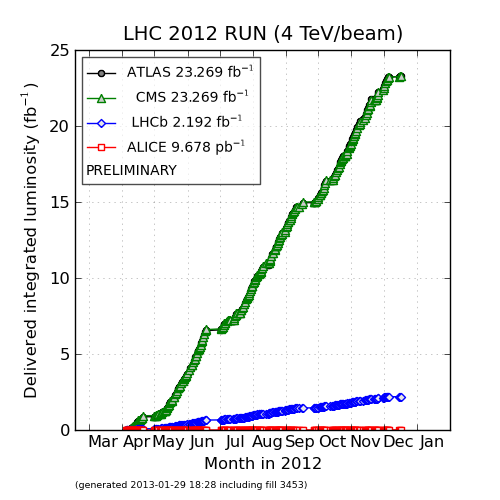 Updates from ATLAS, CMS, and LHCb will definitely be available via #Pheno2012, and, as always, Happy Colliding. PS, The detector experiments have already received 1 fb-1 worth of proton-proton collisions. Most of all, the LHC is a machine with the purpose of breaking the known laws of the Universe. It is a fun question with plenty of answers. So take your pick which is your favorite answer, or add your own in the Comments Section below. Oh, and stay tuned for posts and updates! The summer conferences kick off next week with Pheno 2012 (hashtag: #Pheno2012), and from what I gather quite a few QDers will be there. It is a machine on the verge of identifying the object responsible for electrons’ massiveness and photons’ masslessness [ATLAS,CMS]. It is a science experiment with the goal of replicating, on a sub-nanoscopic scale, the Big Bang in order to search for missing antimatter [LHCb,QD]. It is, believe it or not, a machine that may be capable of producing microscopic black holes [ATLAS,CMS]. 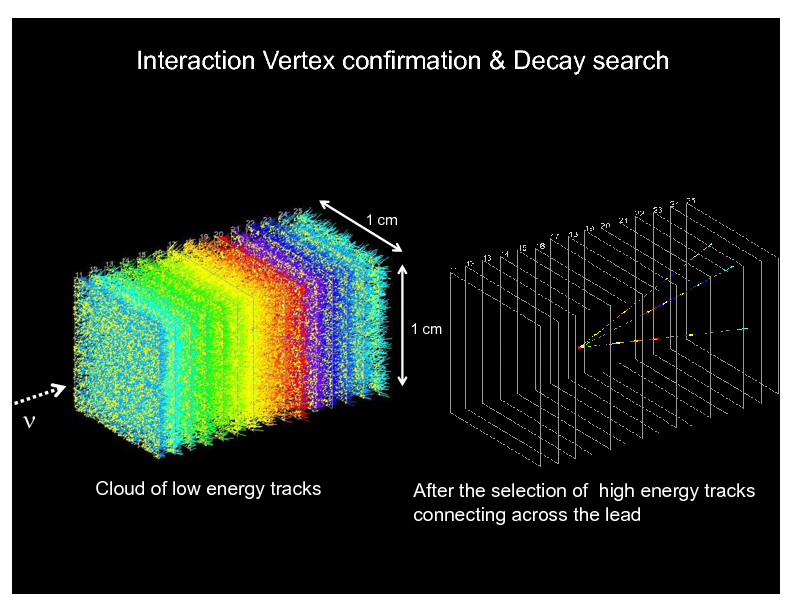 It is an instrument being used to look for a new, higher-energy version of radioactive decay [ATLAS,CMS]. It is a tool that, if it is even possible, may be able to split the quark [ATLAS,CMS]. It is an instrument that may discover, and help explore, new spatial dimensions [ATLAS,CMS]. It is an effort to push computing power to its limits, and beyond!, by generating over 15 million gigabytes (15 petabytes) a year and distributing it all over the world [CERN]! It is a science experiment attempting to generate the same substance (dark matter) that makes up 25% of the known Universe and is likely passing through our bodies at this very moment, but has yet to be experimentally detected [CMS]. As a bonus: It is a demonstration of the human race’s inherent nature to work together, and evidence that we have much more in common than what we may believe [CERN, SESAME]. If (light) quarks cannot be directly observed, due to the phenomenon known as color confinement (or infrared slavery as I like calling it), then how do we know quarks exist? This is a really good question and it has a number of different answers. To a physicist, being able to directly observe an object means being able to isolate it and subsequently measure its properties, for example: electric charge. Due to effects associated with the strong nuclear force, quarks lighter than the top quark will nucleate into other objects (hadrons) in about 3×10-25 seconds. This is pretty fast, much faster than any piece of modern electronics. Consequentially, light quarks cannot be directly observed with present technology. However, this inability to isolate quarks does not imply we cannot directly measure their properties (like electric charge!). This brings me to today’s post: How physicists measure quarks’ electric charges! Fig. 1: An electron (e-) and positron (e+) annihilate to produce a virtual photon (γ*) that subsequently decays into a muon (μ-) and anti-muon (μ+). Click for full size. However, the electric charges of electrons and muons are both 1 (in elementary units) so the likelihood reduces to just σ0. Convenient, right? As far as measuring R goes, it is pretty straightforward. However, there has to be some caveat or complication since this is physics we are talking about. Sure enough there are a few and I am just going to ignore them all, all but one. In order to determine the probability of producing a particular pair of quarks using electron-positron collisions, experimentalists have to make sure the total energy of the collision is large enough. Simply put, no particle can ever be generated if there is not enough energy to make it. It is an example of the Conservation of Energy. The problem is this: if there is enough energy to make a particular set of quarks, then there is sufficient energy to produce any quark pair lighter than the original set. In addition, it is very difficult to isolate different quark-anti-quark pairs (see the top of this post for why that is). Table 1: R-values for energies below 200 MeV (0.1 GeV) and above 9 GeV. Click for full size. Fig. 2: The R value of light quarks versus energy of quark-anti-quark pair. Click for full size. Credit: F. Halzen and D. Martin, "Quarks and Leptons: An Introductory Course in Modern Particle Physics", Wiley 1984. Time for a little extra credit. If you look closely at figure 2, you may notice that between 5 GeV and 8 GeV all the data points are uniformly above the R=10/3 line. This feature is actual the result of two things: the first is that quarks really do have masses and cannot be ignored at these energies; the second is that the strong nuclear force surprisingly contributes to this process. I will not say much about the first point other than mention that, in our quick calculation above, we pretended to ignore all masses because electrons and muons were so light. 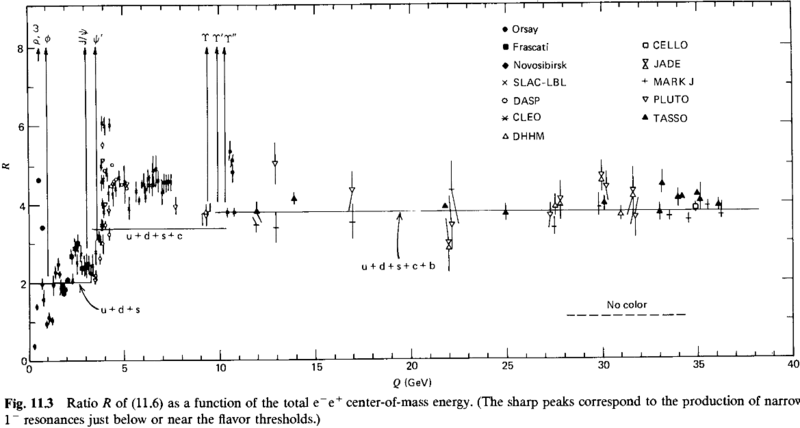 The mass (in natural units) of the charm quark is about 1.3 GeV, and that is hardly small compared to 5 GeV. Taking a closer look at where the virtual photon produces a quark and anti-quar k pair, we realize that quark and anti-quark are pretty close together. They are actually close enough to emit and absorb gluons, the particle that mediates the strong nuclear force. This has a very important consequence. Previously, the quark and anti-quark pair could only be produced in such a way that the total momentum of the system was conserved. However, if we consider the fact that the quarks can exchange gluons, and hence exchange momenta, then the quark and anti-quark pair can be produced an infinite number of different ways that violate the conservation of total momentum, so long as at least one gluon is exchanged between the two in order to restore total momentum. This amplification in likelihood is highly sensitive to energy but it causes about a 20% increase in R between 5 and 8 GeV. This 20% increase in R is precisely the difference between all the data points and the R = 10/3 line. Fig. 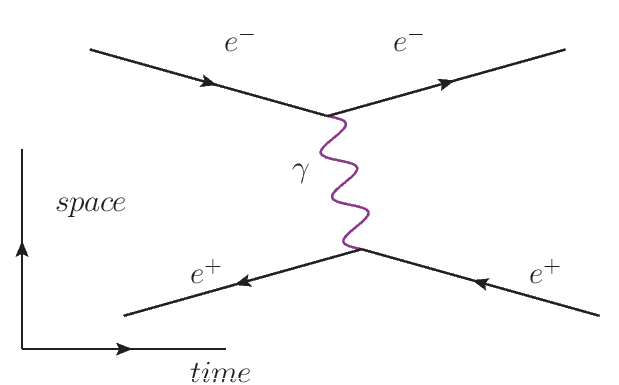 3: A Feynman diagram representing the annihilation of an electron (e-) and positron (e+) into a virtual photon (γ*) that decays into a quark (q) and anti-quark (q) pair. The photon-quark-quark vertex is enlarged to highlight the ability for nearby quarks to exchange gluons. Click for full size. P.S. #PhysicsFact should totally be a trend today. Go! Make it trend! The Large Hadron Collider’s Accelerator Division has successfully collided, for the first time, two 4 TeV proton beams! Congratulations to all who made this possible. I can promise that everyone is looking forward to what may be discovered! 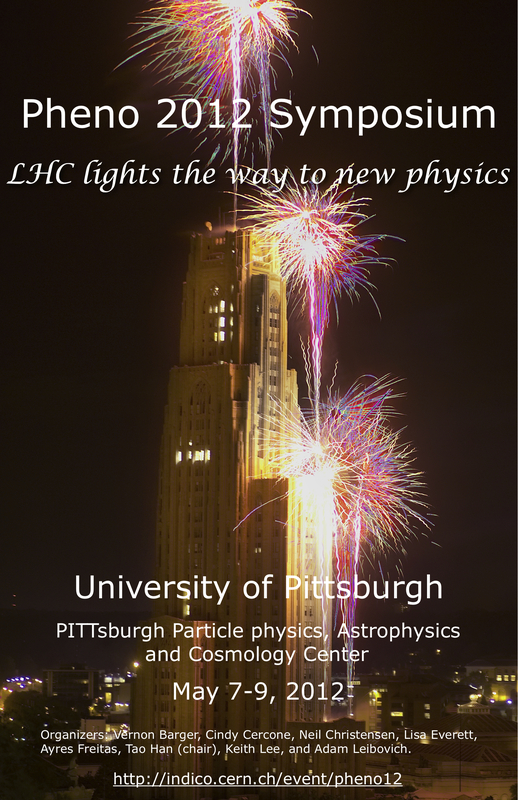 Now enjoy some images courteous of @lhcstatus and @ATLASExperiment. 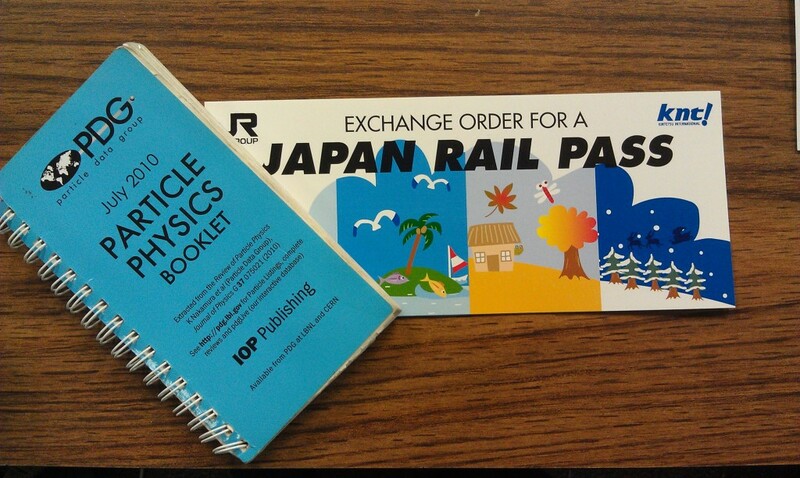 PS: Data-taking for physics starts next week. Happy Friday. In case you have been away from the Wonderful World of Physics for the past few weeks there is now evidence for the Standard Model Brout­-Englert­-Higgs Boson, with a mass of approximately 125 GeV/c2, from the ATLAS, CMS, CDF, DZero, and the combined CDF+Zero experiments [Moriond 2012 Conference, FNAL press release]. This is really exciting, and measurements of Higgs-related processes will definitely have a profound impact on the viability of Beyond the Standard Model theories like supersymmetry and technicolor. 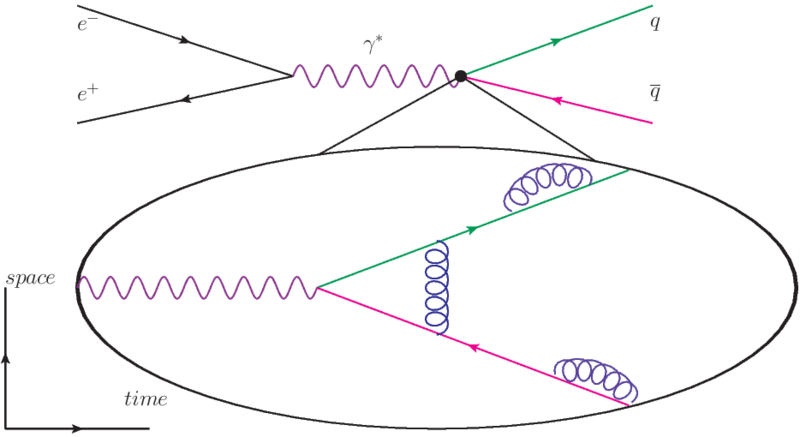 to search for evidence of quantum gravity in TeV-scale proton collisions. We know pretty well that gravity exists. (If you have issue with this, buy two apples and while eating one let go of the other.) We also know things like electrons, muons, & photons exist. (Flip on a light switch or buy a Geiger counter.) What we are less sure about is how, on an elementary level, are electrons, muons, & photons affected by gravity? 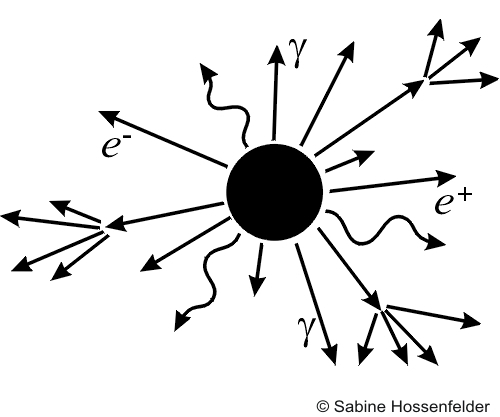 Figure 1: An example of a black hole (center) demonstrating Hawking radiation, which is when a black hole radiates, or emits, particles (e & γ) through interaction with virtual particles. Over the past few decades, there has been a ton of research investigating this very question, resulting in very fruitful and fascinating discoveries. For example: black holes can radiate photons and other gauge bosons by interacting with particles that have spontaneously been produced through quantum mechanical fluctuations. This is the famous Hawking radiation (See Fig. 1) . Two other examples that come to mind both attempt to explain why gravity appears to be so much weaker than either the strong nuclear force (QCD) or the electroweak force (EWK). Their argument is that all Standard Model particles are restricted to three spatial dimensions, whereas new physics, include quantum gravity, exists in more than three spatial dimensions. The difference between the two theories is that the Large Extra Dimensions (or ADD) model supposes that all additional spatial dimensions are very small (<10-20 cm) but that each dimension is not too difference from what we experience everyday (See Fig. 2) [4,5]. The Randall-Sundrum model, on the other hand, proposes that there exists only a single extra dimension but that this spatial dimension is “warped” and unlike anything we have ever experienced [6,7]. I have not even mentioned string theory, but I am sure you can imagine that the list goes on for a while. Figure 2: In the ADD (Large Extra Dimension) model, an electron (e-) and positron (e+) may annihilate and produce a graviton (G) and photon (γ). A defining feature is that the Standard Model particles (e±,γ) are restricted to the move in 3 spatial dimensions, whereas the graviton may propagate in additional dimensions. Despite the number of models trying to describe gravity at the most elementary level, there is actually a phenomenon that is surprisingly common to most all of them: they all predict the existence of microscopic black holes, or at least something very close to it. Now here is where I can easily dig myself a hole, so I want to be clear. The black hole-like objects these models predict are vastly different from the star-devouring black holes we have grown to know and love. Those exist at the center of galaxies and other places like that. The most obvious difference is that astronomical black holes are, well, astronomically huge. The black holes that I am talking about, if they exist, are significantly smaller than a proton. The term “microscopic” makes these things sound much bigger than they are. Secondly, the masses of micro-black holes are comparable to the energy of the LHC; consequently, they will evaporate (via Hawking radiation) and disintegrate (decay) within moments of being produced. In the off chance that a stable micro-black hole is generated, then after about 10-25 seconds the thing will decay and burst into a blaze of glory quarks & gluons (See Figs. 1 (above) & 3 (below)). Research has also concluded that these things are harmless and CERN has gone out of its way to inform the public of this. Figure 3: "-->--" is the path the microscopic black hole travels (exaggerated) while evaporating, before decaying. Click to enlarge. Admittedly, the fun part of writing this post was trying figure out a way to describe just how a microscopic black hole event, if it existed, would look in an LHC collider detector. 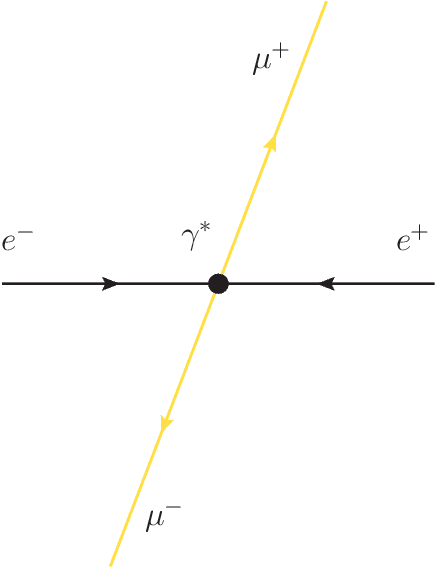 Hawking radiation is straight forward enough to draw (Fig. 1), but things are a bit more involved when you want to show that some of those photons and Z bosons decaying into, say, electrons and positrons. So I got a little carried away and drew things by hand. Figure 3 shows a “typical” a micro-black hole, if they exist, briefly zipping around the detector radiating photons (γ), Z’s, W±’s, and gluons (g), before bursting into a bunch more bosons all at once. These bosons will then do whatever particles normally do in a particle detector and make a mess (shower and hadronize). A very distinguishing feature that I want to highlight is the number of particles that are produced in a single micro-black hole event, this is called particle multiplicity. If they exist, then the average micro-black hole event will result in a very high multiplicity (number) of final-state particles. This is really important because in a typical proton-proton collision, things are not as busy. To clarify: plenty of things happen in proton collisions; micro-black hole events are just a bit busier. When protons collide, only two or three primary particles are produced and these then decay in predictable ways. In addition, the incident protons fragment and hit the side walls (“end caps”) of the detectors. 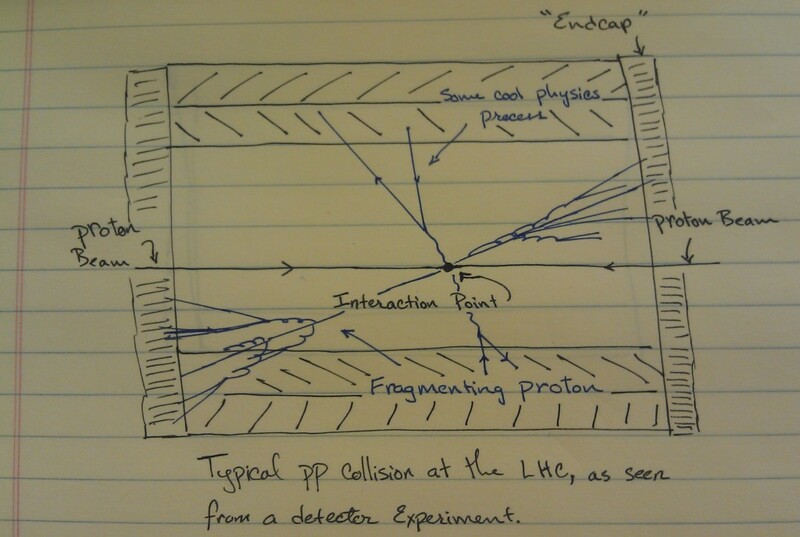 Figure 4: Typical proton-proton collision at the Large Hadron Collider as seen from a Detector Experiment. Click to enlarge. This is it though. This is how experimentalists test whether these gravity-motivated theories correctly describe nature. What differentiates microscopic black hole events from any other proton-proton event is the number of final-state particles seen by the detector. In other words: particle multiplicity! There are not too many Standard Model processes that will result in, say, 10~15 final-state particles. If suddenly a experiment group sees a bunch of 15-particle events, then more refined searches can be performed to determine the root cause of this potential signal of new physics. The most recent results from the ATLAS and CMS Experiments on their searches for microscopic black holes are both from March 2012. In these papers, ATLAS reports using 1.3 fb-1 of data, which is the equivalent of 91 trillion proton-proton collisions; CMS reports using a whopping 4.7 fb-1, or the equivalent of 329 trillion collisions. 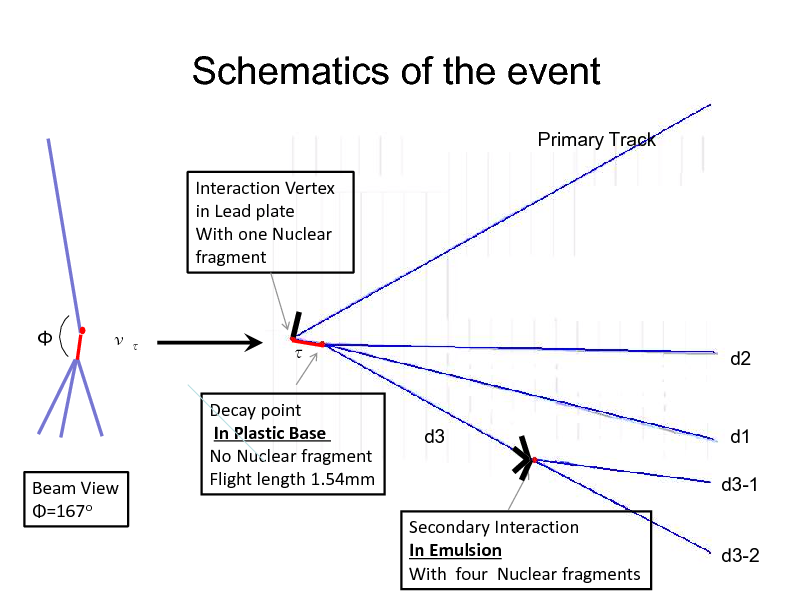 Both groups have opted to look for events with a large number of final-state particles, specifically in the central/barrel region of the detector in order to sidestep the fact that fragmenting protons increase the multiplicity in the detectors’ side walls (end caps). ATLAS, in particular, requires that two of the final-state particles are muons with the same electric charge. This subtle requirement actually has a significant impact on the search by minimizing the number of Standard Model processes that may mimic the signal, but at the cost of reducing the number of expected micro-black hole events. 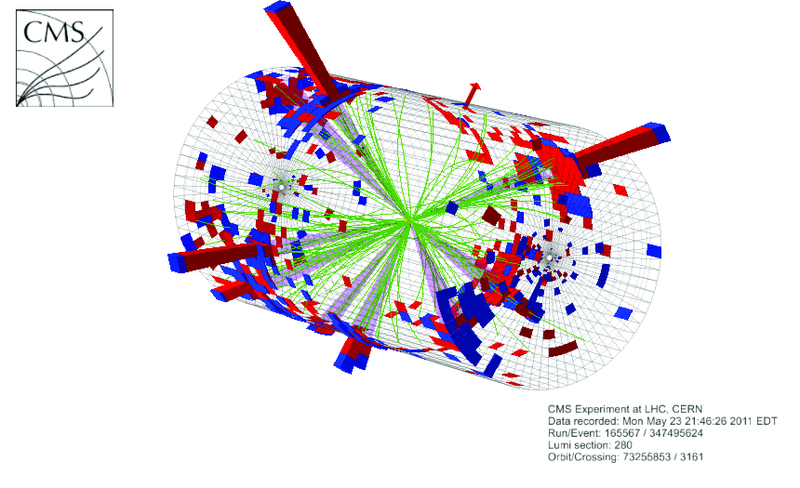 In order to optimize their search, CMS sums the magnitudes of all final-state particles’ momenta. This is a bit clever because with so many additional particles this sum is expected to be significantly larger than for a typical Standard Model process. Sadly, as you have probably guessed, neither group has seen anything like a micro-black hole. 🙁 At any rate, here is a really cool micro-black hole candidate observed by with the CMS detector. It is most likely NOT an actual mico-black hole event, just a couple Standard Model processes that passed all the analysis requirements. Pretty, isn’t it. 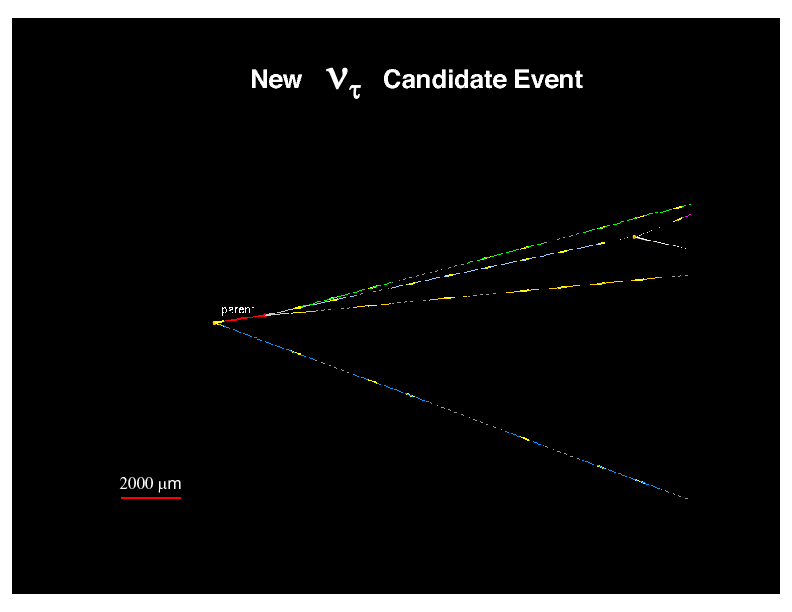 Figure 5: A candidate microscopic black hole event observed with the Compact Muon Solenoid Experiment. Click to enlarge.